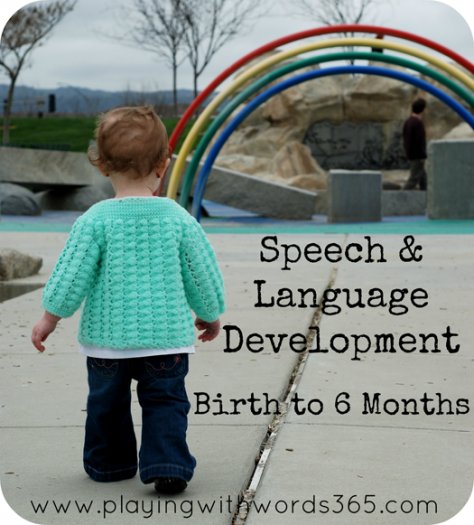 Welcome to part one in my Speech and Language Development Series: Birth to age 5! Today we will be discussing your child’s speech and language development from Birth to 6 Months. Even though your little one isn’t talking yet, she is already learning language and laying the foundation for her future speech and language skills thanks to YOU. Yes, YOU! It is believed that infants from birth to around 6 months are not yet communicating with intent. This simply means that your little is reacting to her world around her but may not actually have a specific intent for her reactions (i.e. She cries because she is wet and doesn’t like it but hasn’t yet started crying with the specific intent of calling you to change her diaper) . However, it is your reactions to your child’s early cries, coos, grunts, gurgles, smiles, and babbling that will teach your child the cause and effect relationship that is communicating. Not only that, but the way in which you speak to your little one, often called baby talk or parentese also is beginning to help shape their world. When you are speaking to your child in parentese you will also find yourself referencing the objects you are referring to with your eye gaze. This pattern of parentese and eye gaze will invite him to engage in joint attention. That is, you will be showing them how to share attention of different objects and actions in their environment while teaching how to use eye gaze to communicate. We will discuss this skill in a little more detail in the next installment. In the first six months of life, you will find yourself interpreting your little one’s behaviors and responding to them. When your baby makes a cry and a distressed facial expression, you may respond by burping her. When your little one gazes at a toy just outside her reach, you may respond by dangling it in front of her or handing it to her. When she cries, you respond by changing her diaper, feeding her, or picking her up. You see, it is this relationship between an infant and his caregivers, a partnership if you will, that helps to lay the foundation and framework for her speech, language and communication skills. Each of these little, natural, and seemingly unremarkable moments are in fact, very remarkable for your little one. These moments, each tiny moment, help your child develop into a communicator. Once you start to get the cries under control and are really starting to get used to having this new little human in your life, your child will start to communicate in new ways. In the second and third months of life your baby will begin to show three major early communication skills: prolonged eye contact, social smiling, and cooing. Social Smiling: This is probably one of the most exciting early milestones for the majority of new parents: The first real social smile. This is one the first signs of a reciprocal social interaction: smiling in response to your smile. Soon she will begin to smile in response to things she enjoys and makes her happy like daddy’s silly songs and mommy’s kisses. Cooing: Cooing is the first step in speech. Your baby will begin making “oooooha” and “aaaaahhhs” somewhere around 8 weeks or so. This is her first attempt at trying to sound like you. She is trying to make all those sounds you are constantly making around her: You know…talking? So when you hear her coo, coo back! Say something! Sing! This is your baby’s first attempts at speech so let her know that you are listening. Now that you have the first three months under your belt, your little lump of a baby will begin to show you that she is listening and learning. Chances are, you have been chatting away to her in a high pitched tone while emphasizing important words and repeating yourself a lot while using exaggerated facial expressions. This speech pattern, referred to as baby talk, motherese or parentese is helping her learn new words and phrases, even though she can’t say them yet. So keep it up! In the next three months of life, you’ll notice she will quiet and attend when someone speaks to her, or when someone enters her visual field. She will begin to attend to music and toys that make noise (though I hope you don’t have a ton of these toys). She will begin to prefer happy, smiling faces to angry ones and will be able to distinguish family members from strangers. How do you know? She will smile at you when she sees you and make happy noises! Though these things may not seem to relate to speech and language development, they do. All of these little skills relate to way she processes and learns about her environment and shows us that her little brain is developing and growing. But one of the more exciting things in relation to speech development starts now: Babbling. Right around 4-6 months your little one will start to babble in redundant strings like babababa or dadadada (many of the first babbling will contain the bilabial sounds such as /b/ /p/ and /m/). She will start to partake in “vocal play” where you may hear her babbling away and making an array of different sounds and squeals as she experiments with her new skill. You may also hear your little one start to take part in some oral-motor play by blowing raspberries. This is especially fun when they have a mouthful of mushy carrots 😉 Soon your child’s babbling will become more complex (we will talk about that in the next post). If you want to read more about babbling right now, head over to my post What Is Babbling. In addition to babbling, your 4-6 month old will be starting to show her pleasure and displeasure with her vocalizations and with her laughter. Is there nothing sweeter than the sound of an infant’s laughter? 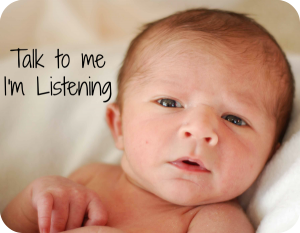 So…your little one is listening and she is starting to babble and takes part in vocal play. She is laughing and blowing raspberries. She smiles when she sees you and may even squeal with delight. She will let you know how she is feeling with her vocalizations and facial expressions. She is communicating with you. And along the way you are talking to her in short phrases, a high pitch voice, while making exaggerated facial expressions so she can learn about her world. You are watching her carefully and interpreting all her moves and reacting to them. As you react, she learns. So what is in store for the next 6 months leading up to her first birthday? Check back next Wednesday for the second installment: Speech and Language Development 6-12 months. And if you are a “chart” person, feel free to check out this chart I made that covers speech and language development from birth to 12 months HERE. And now I want to hear from YOU. Questions? Comments? What is your favorite memory from your infant’s first 6 months? Thank you for the great post. My second baby is 3 months old now and I absolutely adore all the talks and smiles and laughs that we share. Love to see him and his older brother who is 3 trying to communicate. Hi Apetta, so happy to have you here! Welcome! My 6 week old just started smiling a few days ago. He was in my lap while I was busy talking to his 2 year old brother. I looked down and was so surprised to see the biggest grin on his face as if saying “hey mom, I’m here too. Pay attention and talk to me too!” And it totally worked – I was lost in that sweet smile! This is great!!! My boy will be 6 months in 4 days. Wow! Time flies. He is totally at the blowing raspberries phase. He also does this very long flat aaaaaaaaaaaah at the back of his throat. Quite strange, but funny (except at 4 a.m.) I’m excited for the next part! I am an SLP and a mom of a 3 month old. She has already begun to babble and being the SLP that I am, I am constantly working on joint attention, eye gaze, and such. I absolutely love your blog! Do you have any info/opinions on apps for Lang/speech development? Maybe it’s already on your site but I may have not found it yet! Very informative. I have added a link to your blog on our facebook page at https://www.facebook.com/KidsCareList/posts/234470346744705?stream_ref=10 Hope you don’t mind it. Hi! I just found your Facebook website as I was surfing the internet. I love all the information you provide. It’s very helpful to parents and professionals. I too am a SLP. I graduated in 2002 and have practiced in a variety of settings including skilled nursing facilities, home health, hospitals, private practice, schools, and 0-3 (earlysteps which is my state’s Medicaid early intervention program). I have recently branched out on my own and I’m currently in the credentialling process to obtain contracts with private insurance and Medicaid to see kids privately. Any advice? Any helpful hints for just starting out? My clientele will most likely be 0-middle school age kiddos. Thanks in advance!